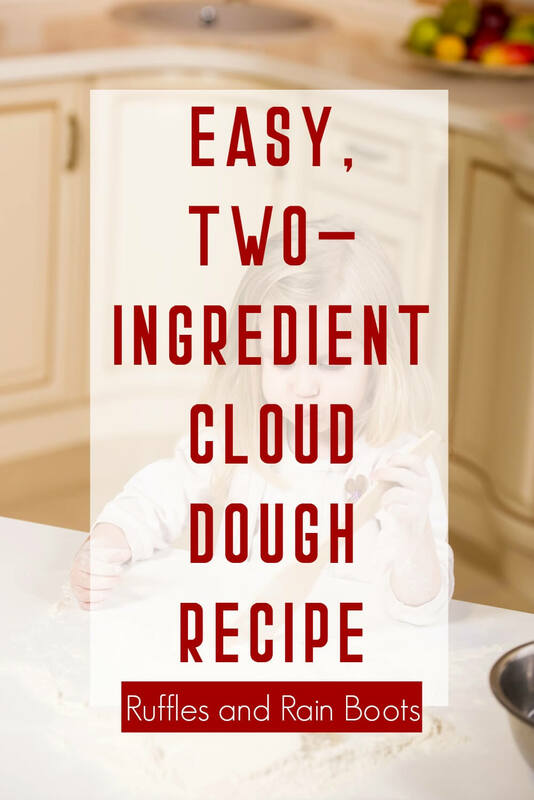 This easy cloud dough recipe uses what you have on hand in your kitchen and comes together in no time. It’s perfect for little explorers of any age. I was looking to make another sensory activity for Danger before the hustle-and-bustle of all the windows and siding replacements begin next week. I had a ton of flour on hand and only one small box of baking soda, so I made a cloud dough with flour and it’s SO SOFT. 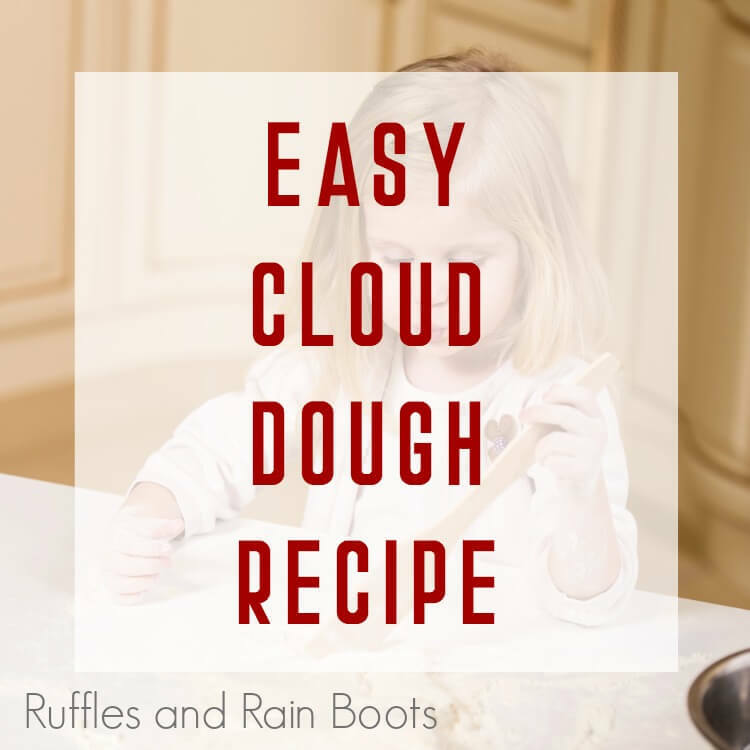 This is a very simple cloud dough recipe – it’s just 2 cups of flour and 1/8th cup of oil. We used vegetable oil for our batch and it was perfect. Note: Do not use coconut oil because when it clumps horribly. 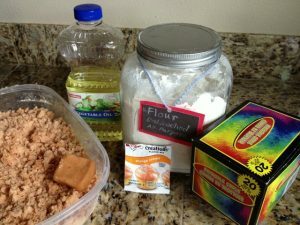 Use vegetable oil to get an edible cloud dough base. We also added a cupcake flavoring I found – it smelled like orange creamsicles and it immediately brought me back to childhood. If I would have stopped with the ingredients above, this would have been an edible cloud dough! I wanted to give her a colored dough, however, so I used sidewalk chalk shavings I scraped off with a butter knife. 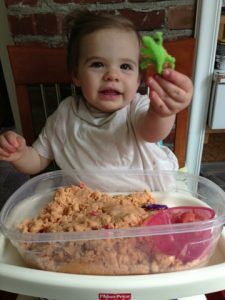 I gave E a chance to whittle the chalk with her wobbler-friendly utensils, too. Once you’ve mixed up a couple of cups of the cloud dough with flour, you’re safe to put it in an airtight container and reuse it. You can also store it in a large zip-top baggie. I ended up making a couple of batches and coloring each one different colors for a rainbow cloud dough sensory bin. She LOVED it and it was really easy to store each color separately until play. 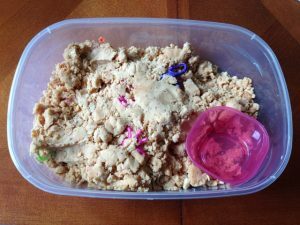 I used a few themes in our cloud dough sensory bins that were HUGE hits. If you collect erasers (doesn’t everyone?! ), they are perfect to go into the flour cloud dough. 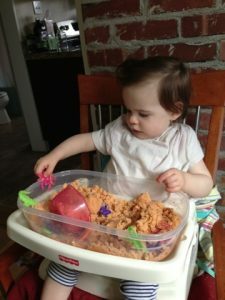 We also set up an itsy bitsy spider sensory bin which she loved. It’s a favorite book around here. 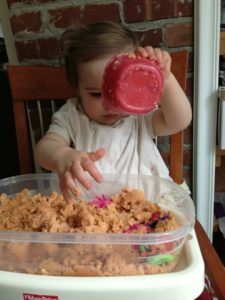 That’s it for this easy sensory play experience for children, friends. It only took minutes to set up and it lasted a while. 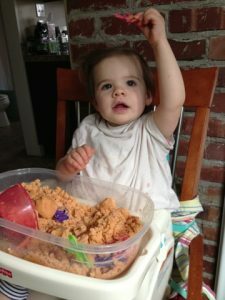 E really loved digging to find what surprises I hid in the dough.